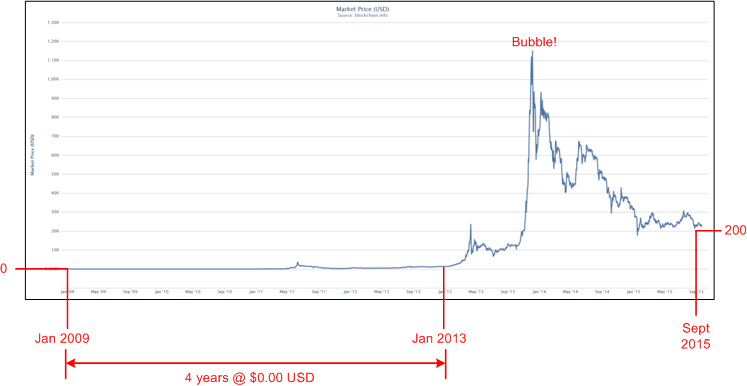 The following chart traces the Bitcoin price in USD since the system was first placed into operation in 2009. For approximately four years, each Bitcoin was worth close to $0.00 USD. The very first exchange of Bitcoins for goods occurred in 2010. It was 10,000 BTC for two pizzas worth approximately $25 USD. At $200+ USD/BTC today, those pizzas would cost $1M each! Imagine all those early experimenters who purchased or mined Bitcoins during the 2009-2013 time span – and then deleted their wallets from their PCs because they concluded that Bitcoin was a passing fad. I’m glad I’m not one of them. On the other side of the “coin“, I’m also glad that I didn’t jump into the market during the peak of the bubble in late 2013 at $1100 USD/BTC. After entering the market this year at $230 USD/BTC, I wonder how I’ll feel about that decision in 5 years…..